Emissions of greenhouse gases comes from a variety of sources – solutions must address the diverse technologies behind emissions. To begin with – however – reducing population pressure is best addressed through better health, education and welfare outcomes best achieved primarily through optimal economic development. Some 26% of global greenhouse gas emissions come from the burning of coal, natural gas, and oil for electricity and heat. It is the largest single source of global greenhouse gas emissions. Black carbon – although an aerosol and not a greenhouse gas – has an overall greater warming effect. Here’s some technology costs from the World Energy Council. There are a number of technologies – including renewables – that have costs of generation less than US$100/MW. These are levelised costs – they include construction and operation – as well as a capacity factor – but exclude distribution and backup costs. Some technologies – gas, coal, nuclear – can be utilised more than 90% of the time. Solar and wind provide power for some 30% of the time depending on local conditions. 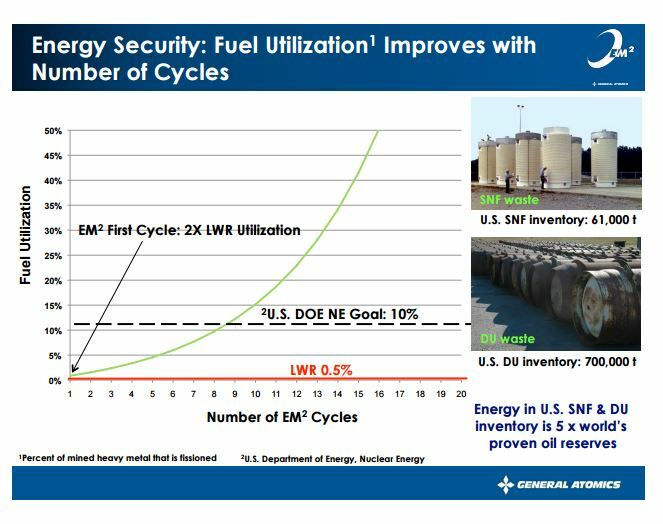 Beyond about 5% of installed wind and solar capacity backup generators and/or storage is required – with considerable impact on system costs. Yet other technologies – biomass, landfill gas, hydro, geothermal – can have high capacity factors but are physically limited to areas that have available resources. At this time, the cheapest generating system is based on coal and gas – with relatively small scale opportunistic generation using hydro, landfill gas, wind, geothermal, biomass, etc depending on resource availability, local construction and operating costs and local distribution costs that vary with technology. Distribution costs – for instance – are higher for large, centralised plants and lower for smaller, distributed generation. Solar for daytime cooling of commercial buildings may reduce distribution costs. Large nuclear plants may need continent spanning distribution systems. into energy with much less and safer waste products. The reduction in the volume of waste on the left is almost off the scale. 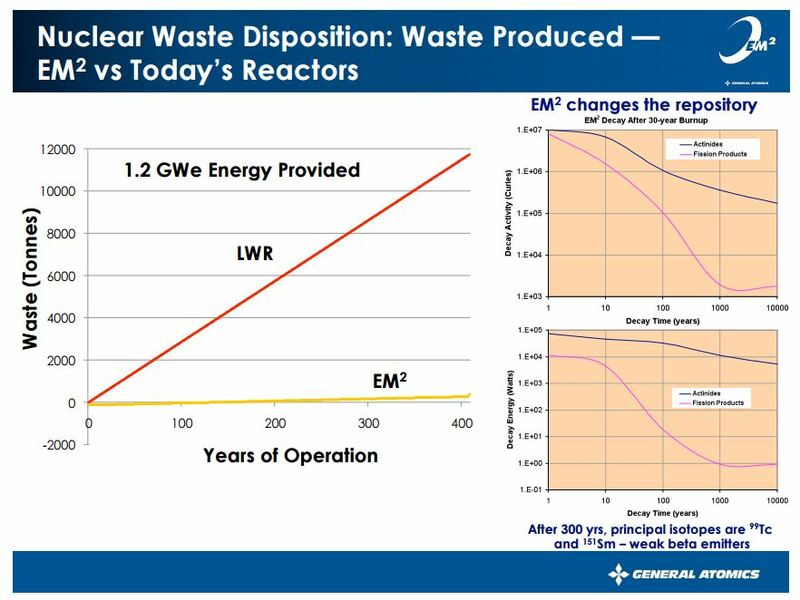 The reduction in radioactivity can be compared to the waste from conventional nuclear – decay to safe products over hundreds rather than many thousands of years. It does this through recycling fuel through a high temperature, fast fission process. This utilises much more of the available energy in fuel. It does this without reprocessing or enriching uranium. These plants are designed to be factory manufactured, delivered to site on a truck, dropped into a concrete bunker and operate untouched for 30 years. The much increased utilisation of fuel means that available resources – conventional waste, uranium, thorium – are sufficient for 1000’s of years of global energy demand. These plants can’t melt down and the waste can’t be used in nuclear weapons. A single unit provides enough electricity for 350,000 people living a western lifestyle. As it is helium – and not water – cooled with a small footprint it can be sited anywhere. 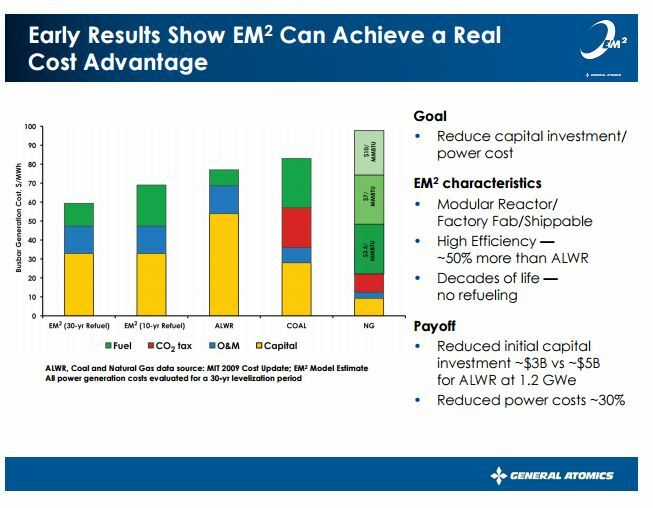 The high efficiency, modular capability and low capital cost reduces cost over conventional nuclear by 30% making it competitive against gas and coal fired plants. Coal and natural gas prices will increase over the next few decades – even without carbon taxes – as resources are exhausted. The advanced nuclear designs produce constant heat – but demand peaks at certain times of the day and seasonally. This leaves open another possibility to utilise the heat that would be otherwise wasted. High temperature production of hydrogen. 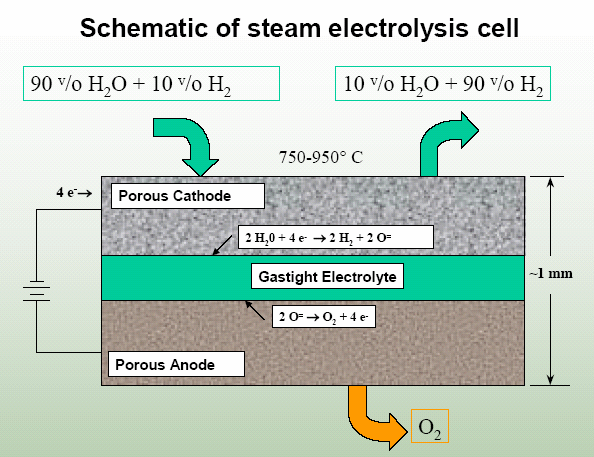 ‘Essentially, the electrolytic cell consists of a solid oxide electrolyte with conducting electrodes deposited on either side of the electrolyte. A mixture of steam and hydrogen at 750-950ºC is supplied to the anode side of the electrolyte. Oxygen ions are drawn through the electrolyte by the electrical potential and combine to O2 on the cathode side. The steam-hydrogen mixture exits and the water and hydrogen gas mixture is passed through a separator to separate hydrogen. The hydrogen produced can be combined with carbon dioxide captured from the atmosphere to produce liquid fuels. Thus solving another 13% of the greenhouse gas emission equation. Solving the remainder – including black carbon – requires changed productive systems and practices over a number of sectors. • Industry (19% of 2004 global greenhouse gas emissions) – Greenhouse gas emissions from industry primarily involve fossil fuels burned on-site at facilities for energy. This sector also includes emissions from chemical, metallurgical, and mineral transformation processes not associated with energy consumption. • Agriculture (14% of 2004 GHG emissions) – global greenhouse gas emissions) – Greenhouse gas emissions from agriculture mostly come from the management of agricultural soils, livestock, rice production, and biomass burning. • Transportation (13% of 2004 global greenhouse gas emissions) – Greenhouse gas emissions from this sector primarily involve fossil fuels burned for road, rail, air, and marine transportation. Almost all (95%) of the world’s transportation energy comes from petroleum-based fuels, largely gasoline and diesel. • Waste and Wastewater (3% of 2004 global greenhouse gas emissions) – The largest source of greenhouse gas emissions in this sector is landfill methane (CH4), followed by wastewater methane (CH4) and nitrous oxide (N2O). Incineration of some waste products that were made with fossil fuels, such as plastics and synthetic textiles, also results in minor emissions of CO2. This entry was posted in Focus Area 1, Focus Area 12, Focus Area 15, Focus Area 8, Focus Area 9 and tagged appropriate technology, black carbon, climate change, energy, power generation. Bookmark the permalink. Yet another informative article Chief. It has always been my belief that emissions of methane, CO2 and nitrous oxide can and do result from human activity but that that natural sources predominate and that natural sinks act to sequest much of any excess gases that human activity alone may cause. Thanks Peter – you’re too kind. All of the ‘solutions’ to emissions – and we are emitting large amounts of greenhouse gases – I discuss have benefits for health, agricultural productivity, ecological conservation and restoration, economic growth, etc. Access to cheap and reliable power is one of the ‘phenomenal’ MDG. A benefit to cost ratio greater than 15. The reserves to production ratio for coal is 109 years – and dropping rapidly. We probably have some 60 years supply left. Less for oil. The development of cheap alternatives is essential. A gas (where resources are cheap and available) to advanced nuclear strategy makes sense for electricity generation. Still only addresses 26% of greenhouse gas emissions. . I wrote this write up below originally as a comment on Prof Curry’s blog: How to address CO2 Emissions and Global Warming. It aligns with some of the thinking above, but I would add that after looking at various nuclear technologies, the one with the most promise for low-cost safe operation and high ulitization of U235 is flouride-salt-cooled (with solid fuel) AHTR designs. The most important question in the climate and man-made global warming is “How much warming will CO2 cause?” That determines what actually happens as a result of fossil fuel use and other practices. Yet when it comes to addressing the issue, this question is less important. No matter the impact of CO2, any real solution must adhere to principles of progress. The argument is made that AGW is causing drastic impacts, and because of those drastic impacts, that justifies a drastic change to economic principles or to development models. That is a fundamentally invalid argument. The answer to the question of magnitude of impact will not and cannot dictate a response that overrides basic principles of how we would need to solve any such challenge. Principles of progress tell us that any solution to this challenge will come in the form of adoption of technologies that can be developed as part of our market-based economy. It’s a mistake to believe that simply because man can impact the environment, we need fundamental changes to economic systems. The economic systems and models that bring us wealth and a higher standard of living enable us to expend some of that wealth surplus to address such challenges. Most climate mitigation proposals have significant negative benefits in the first decades of implementation, indeed for the most of this century. The reason is simple: The cost of regulatory schemes and structures is very high relative to the impact. Even to cut all US emissions in half between now and 2050 would impact the temperatures of the earth less than a tenth of a degree. Despite the hype surrounding the claimed urgency of ‘we must act now’, the reality is that CO2 has not done significant harm yet, and is unlikely to cause significant harm in the near-term future. Thus, we should think LONG-TERM not short-term in terms of changes and impact. If man’s emissions are indeed a problem, the greatest AGW impact is from CO2 emissions from energy-using sources, ie, fossil fuels, it is self-evident that the greatest leverage for a solution is GHG-emissions-free power generation. We already have such technology available: Nuclear power generation; solar power generation; wind power generation; geothermal. If we stick with the principle that we need a market-based economy, the main challenge to adoption of nuclear and renewables is cost. The main reason utilities pick one particular form of electric generation is cost; secondary issues are the adaptibility to the grid and the utility of the power source for baseline, peak usage, etc. We need to pursue technology improvements that lowers the cost of nuclear power, solar power and other renewables. The good news is that lower-cost nuclear and solar is more than possible. Moreover, nuclear power as a source of baseload power, solar as an additional variable source of power, and natural gas and hydro power as a source of peak power all complement eachother. Renewables such as solar PV generation and wind are still not cost-competitive with fossil fuels for general grid utility generation, but are on a track of cost reduction that could make them cost competitive within a few decades. Intermittent power sources like solar and wind create grid challenges that require complementary power sources. Nuclear power generation provides emissions-free baseload power and can complement other renewables, alongside gas turbines for peak power. As with solar, the challenge to further adoption of nuclear power is cost. Nuclear power plant construction and capital costs are the main impediment to further adoption. The path to lower-cost nuclear power is through new technology. Because of a tightly regulated nuclear power industry and lack of government support for development of new nuclear technologies, most power plants in the US were built between 1970 and 1990 and are based on technology that is just as old. Worse for nuclear technology development, the last research reactor was closed down in 1994. We have had, at a time when nuclear technology holds the promise of solving a perplexing problem, a shocking lack of commitment to developing improved nuclear power generation. less costly. One design, by MIT professor Charles Forsberg, called the AHTR, combines a flouride-salt-cooled reactor with a gas turbine; one variation on it incorporates injecting gas to the turbine for high temperature turbine generation, so that the power plant can operate for both baseload and peak power. This new nuclear technology, because it operates at higher temperatures, can increase thermal efficiency from the 34% or so of current nuclear technology to closer to 50%; it can have more inherent safety features from not being pressurized and have a core that cannot melt down; it can use more efficient combined cycle turbine technologies that require less capital for the same amount of power generated. This combination would be safer and also cheaper – the cost long-term would be half of current nuclear power generation. The path forward would therefore prioritize government research and development, with a focus on reducing the cost of desireable energy technologies. In short, find a way to make nuclear power and renewable power (solar, wind, etc) less expensive. Achieving that in the next few decades would enable the next generation of electric power to be mostly emissions-free by 2050: 50% nuclear, 10-20% gas turbine and 30% renewables (solar, wind, hydro, geothermal). At that time, introducing such power sources on a global basis would cut emissions in half. Since Co2 uptake is already approaching 5 pgC/yr, even a reduction of 50% would end the rise of CO2 on any significant level. A technology-based rather than a regulatory-based solution is the path forward for a better climate, better economy and better world.